Nebraska had a bye week this past weekend so obviously it wasn't hosting any visitors. Given the tough way the season has started, there was some debate on how much the coaching staff would be out recruiting versus at home leading practices or watching film. Donte Williams led the charge to get the staff out on the road a day early and he made the most of his extra time, spending a day out in Los Angeles where he offered a couple new 2019 targets. Williams offered 3-star cornerback Kamren Fabiculanan‍ from Thousand Oaks, California, plus Valencia, California, athlete Jayvaun Wilson‍. After that he made his way down to Thomson, Georgia, to check out 2018 4-star target Christian Tutt‍ play in person. Keith Williams was also in the Los Angeles area on Thursday and both he and Donte made a stop at Long Beach Poly to see 4-star DB target Aashari Crosswell‍ and 4-star wide receiver target Jalen Hall‍. The Huskers would still like to host Hall for an official visit and I’m told they are pushing for the Northwestern game as a potential date. Poly is also one of those programs that always has Division I talent so it’s smart to keep contact with the school and continue visiting them. After his trip to California, Keith Williams made the trip to Yoakum, Texas, to watch 4-star commit Joshua Moore‍ play. It was really perfect timing to make a personal visit because this weekend Moore went to Tuscaloosa to see Alabama take on Tennessee. Everyone is blown away when they visit Alabama and I’m told Moore enjoyed his visit. However, at this point I would still put Florida State as the main threat to Nebraska at this point. Moore is scheduled to visit the Seminoles on Nov. 4 for their game against Syracuse. Offensive line coach Mike Cavanaugh did end up heading to a junior college to scout players like I was hearing last week. Cavanaugh went to Iowa Western in Council Bluffs in what is a change in recruiting strategy because this staff has been extremely reluctant to dip their toe into the JUCO waters. It’s unclear at this point which player he was evaluating. Trent Bray made his way to Minnesota, presumably to see David Alston‍ play before heading off to Harrisburg, Pennsylvania, to see another epic Micah Parsons‍ performance. Parsons, the 5-star who is one of the most sought-after players in the 2018 class, scored five touchdowns on Saturday. Parsons will reportedly be visiting Oklahoma this coming weekend. 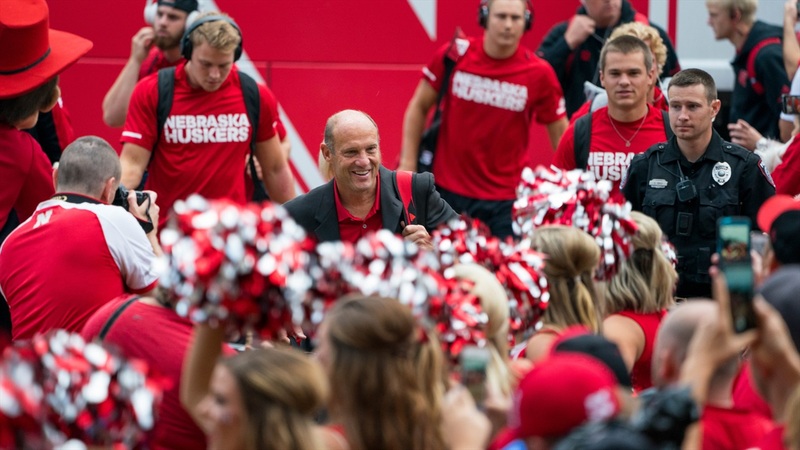 Mike Riley may have had the most interesting weekend of anyone on the staff. He made the rounds in Omaha on Friday as he stopped by Omaha Burke, Omaha North, Bellevue West and Elkhorn South. I’ve said many times that 2018 and 2019 are both good years for local talent and Nebraska needs to prepare accordingly to win those battles. Running back Milton Sargbah‍ at Omaha North and running back Moses Bryant‍ at Elkhorn South are two 2018 guys that are being considered to get scholarship offers from Nebraska. On Friday night, Riley also went to Kansas to see 4-star quarterback Jace Ruder‍ play in person. Ruder is committed to North Carolina and is intriguing because he is a dual-threat quarterback that Riley has been reluctant to pursue for his offense. No word yet on if Ruder has any interest in Nebraska. Saturday, Riley went out to California to see Oregon State commit Spencer Petras‍, a 3-star quarterback. The big (6-5, 215) gunslinger is the prototypical signal-caller Riley goes after and he lit it up during his game. I was able to catch up with Petras and he was aware Riley was there and says that Nebraska wants him to visit Lincoln before making a final decision with the coaching turnover that’s happened at Oregon State.